British scientists at Reaction Engines Limited (REL) are developing an exciting alternative that will offer a brand new way to reach space. Called Skylon, it has the potential truly to revolutionise spaceflight and make it almost routine. 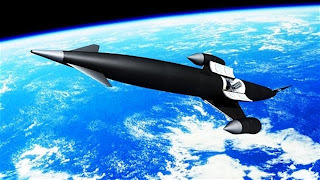 Skylon spaceplanes will operate more like aircraft than traditional rockets, taking off from and landing on familiar runways and being turned round rapidly after each mission to be ready for the next. They promise to slash the cost of getting cargo - or astronauts - into space. Skylon resembles a sleek, futuristic jet with 82-meter long fuselage made from carbon-fiber reinforced plastic with a black ceramic skin to protect against the heat of re-entry. It needs no external rocket tanks such as the Shuttle has. After an automated take-off, it will fly directly into that region of space called low Earth orbit (LEO) where it will be able to dock with the International Space Station, launch satellites or even help construct interplanetary spacecraft. Different cargo modules are envisaged, including one that could carry up to 24 passengers, offering another option for space tourists to experience space or stay in orbiting hotels, as well as for taking working astronauts to space stations. Mission complete, the pilotless craft will then return into the atmosphere to land like the Shuttle does on a runway where it may be prepared for its next flight. Amazingly, its designers say this turnaround can be achieved in just hours because Skylon will be 100 per cent reusable.